"There are so few pieces left, how can we really know?" There's an attitude that I've come across more than a couple of times in discussions centered on whether or not a certain costume in a certain film is accurate, or when someone asks about improving their own kit. It's not quite inevitable, but a good amount of the time someone else will come in and say, "Nobody really knows what they were wearing, because none of us were there." Or, "We have hardly any extant clothing, compared to the amount that existed at the time, so you don't actually know what's right and wrong." This is wrong on a few levels. 1) There are a lot more extant garments than you think. 2) There is even more relevant two-dimensional art. So much! Do I even need to list museums, really? There are court portraits, folk art portraits, satires, genre prints, fashion plates, all kinds of pictures that show all sorts of people, with all levels of detail. You will never run out of art to study for information about clothing, and it's even easier to find than extant garments because art's had a cachet for centuries that old clothing has only had for a few decades. 3) Everything out there is not "high fashion" or "for the very wealthy". It's true that few truly workaday outfits exist today. But there are some out there. For example, there are the Furr homespun dress from North Carolina and a similar gown worn by Elizabeth Williams in the same state 1993.137.1 in this collection) from the mid-19th century. And the Manchester Art Galleries have two servants' uniforms from the 1890s (the collections are down at the moment, unfortunately). What there are a lot more of are middle-class pieces. That's what fills those smaller museums I talked about. Are they silk and wool? Yes. But when you take the entire idea of synthetic fabrics off the table, it's much easier to see why people felt it was worthwhile to spend more money on cloth that was finer than printed cotton for best dresses. Once you start to examine pieces, the differences between atelier-made couture and clothes from the dressmaker down the street become very obvious - so while the first impression of a wedding dress like this one might be, "wow, it's so fitted and has all those extra details!" with more experience you note how plain it is, and how very simply made. (It was sewn by the bride.) Middle-class might be significantly nicer than one person's intended impression at an event, but the clothing can tell us a lot about which details were seen as high fashion and which were simply "the way we make clothes". I'm sorry this turned into a bit of a rant - when I began it, I seemed to be seeing comments around every corner on this subject. And what they relentlessly insinuate, even if the commenters don't intend it, are two unfortunate things. One is that fashion history is unstudiable, or is studiable only for the most wealthy people at any given time, which is annoying as it's inaccurate (see above). The other is that anybody who thinks they're studying fashion history is too stupid to realize the limitations of sources, which is annoying as it's insulting! Please give us some credit. Oh yes! I'm constantly grateful to have been born into the generation I was born into, because I get so much off the internet. 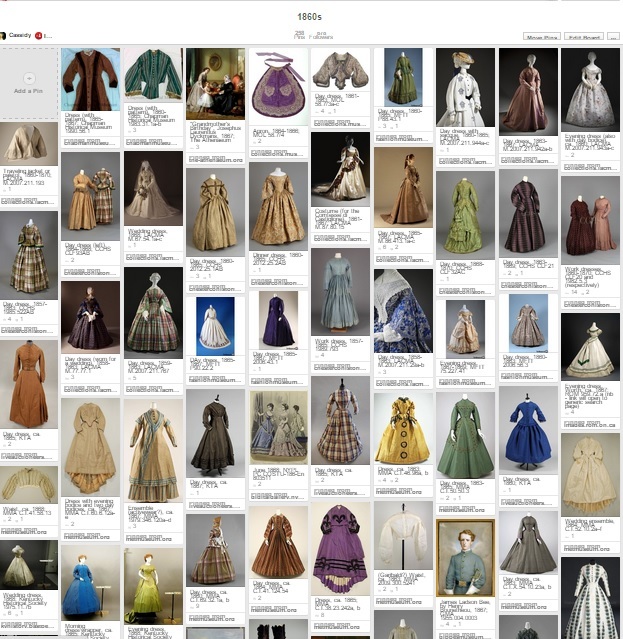 A lot of my skill in dating from about 1850 to 1910 comes from studying the huge number fashion plates on the NYPL's website - "What exactly was the back of the skirt doing in January 1882? Okay, and when in that year did it start to develop backward into a bustle?" etc. My impression when this comes up is that they're not from the pre-internet days of the hobby/field, but that they're new to it and in part haven't realized all there is, part didn't like the "X is vastly more likely than Y for that place/year/class level" statement that was given in response to some question. I hope you can get in there! We have so much here at SLCHA and nothing to display them on, so the dresses never ever get used. A small dress form's going on the wishlist in the next issue of our newsletter, and hopefully some members will donate toward it. And it's a good blog!